The song â€œWinter Wonderlandâ€� would be an understatement for this Ohio lighthouse. The Cleveland Harbor West Pierhead Lighthouse recently developed an icy coating, as waves from Lake Erie crashed against it in subzero temperatures, according to a Washington Post report. 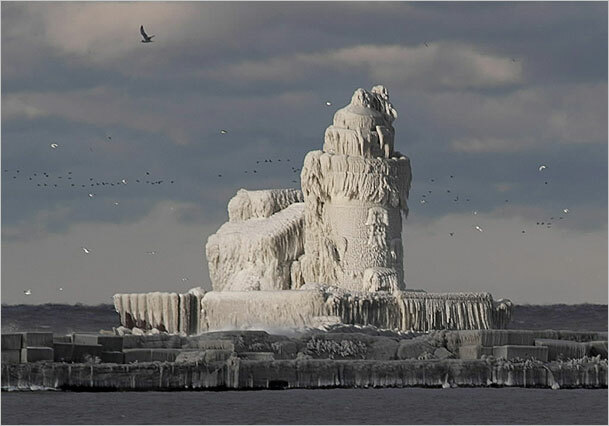 As a result, it is entirely frozen, resembling the Ice Queenâ€™s castle from the Chronicles of Narnia. While it may resemble a mythical object, the lighthouse is very real. Built in 1911, the lighthouse was automated in 1965, flashing a white and red light every five seconds to warn oncoming ships of the shore ahead, according to its website.